How is your curb appeal? Evaluating your curb appeal and enhancing your front yard landscape can reveal many benefits. Creating the right curb appeal by Landscaping can increase the resale value of your property by as much as 14%http://www.magicoflandscaping.com/Research/SmartMoneyMagazine_FertileGround.pdf. My favorite thing about curb appeal is the smile it brings to your face as you pull into your driveway. Creating great curb appeal can be achieved by creating definition with a landscape design makeover or some simple maintenance techniques. Does your landscape require a lot of maintenance? 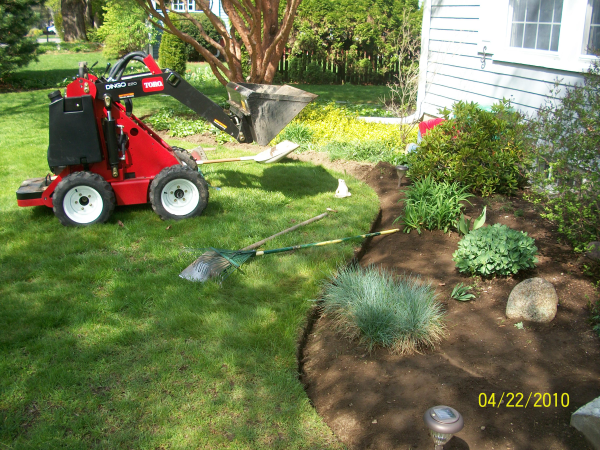 Keeping your landscape free of many hours of back breaking labor can be a challenge. Make informed choices about landscape material and how to install it correctly. For example, if you strip/smother a section of lawn to create a new bed mulching it correctly will help with weed control and plant health. Knowing your plant material and practicing the “right plant in the right place” philosophy will save some headaches down the road. How is your front yard landscape defined? My most favorable landscapes are ones that clearly identify how you should move through them, like a nicely lit pathway to the entrance of the house, or a stepping stone path that creates a shortcut through a bed. Lights, borders and plantings are great additions to any front yard landscape to create definition. Is your front yard landscape considering all seasons? Including holiday touches with wreaths, lighting or winterberry touches are nice additions. Making sure that your gardens are color enhanced and provide interest throughout the growing season. Adding plants that provide winter interest i.e ornamental grasses, sedum, Birch, Redtwig dogwood etc…. Is your front yard enjoyable? Make sure you take care of the obvious. Creating Privacy, blocking wind, muffling street noise or encouraging a special focal point. A great landscape design will create intimate spaces to for you to enjoy.